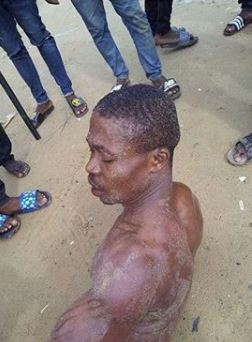 The kind of beaten given to a Married Plumber in Opolo, Yenagoa Bayelsa State Yesterday will definitely last him for years. The yet to be identified man was battered by mobs after he molested a 9-year-old girl. According to reports the married man with kids, who is also a neighbor had sneaked inside the girl’s house and deceived her that her mom sent him to fix a faulty pipe, then Dragged her inside the toilet and defiled her.. The girl’s voice attracted neighbors who pounced on him, and whooped him heavily.